[For which reason, taking] this form, I was struck on all the city’s coinage, making it conspicuous, [a small] impression [of my ancient] strength; but Miletus granted me [yet another] favour in recognition of my excellence, for after my fierce existence on the mountain, I rest overlooking this harbour in a public place. The most famous coin type of ancient Miletus, and one of the earliest of all coins that can be attributed to a particular city, is the electrum stater that features a crouching lion regardant on the obverse, and three incuse punches on the reverse. Although they are not excessively rare, these electrum staters (weighing just over fourteen grams) are understandably very expensive, and no examples are included in this collection. The fourteen-gram staters, however, represent only one denomination in a complete denominational series that also included thirds, sixths, twelfths, and twenty-fourths of a stater, and perhaps smaller denominations as well. These lesser denominations, not surprisingly, command less stratospheric prices. An electrum stater of Miletus ca. 600–550 BC, offered for sale by Edgar L. Owen, Ltd. for $10,000. The reverse punches on the full staters typically include a central oblong punch containing a running fox, and two square punches on either side that feature a stag’s head and a square quincunx. The quincuncial punches are very similar to the quincuncial reverse designs seen on an obscure early series of tiny silver fractions, suggesting that those coins may also have come from Miletus. The electrum third staters and sixth staters feature reduced versions of the crouching lion regardant seen on the full staters, and their reverses usually show only two square punches, one of them again displaying the quincunx. The electrum twelfth staters in the series feature a simple lion’s head right on the obverse and one quincuncial punch on the reverse, while the twenty-fourth staters show a facing lion’s head on the obverse (rather than a lion’s head right) along with an untooled square punch on the reverse. 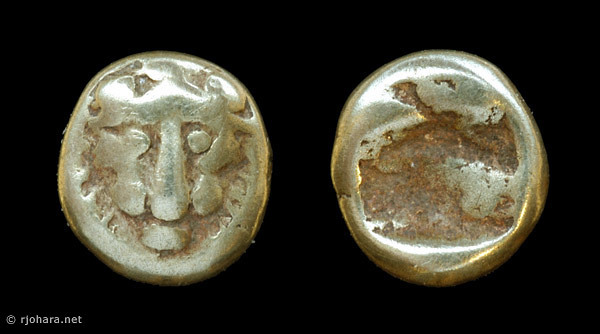 It is possible that a family of electrum forty-eighth staters that variously feature a lion’s face and a scorpion, a lion’s paw and a scorpion, or a lion’s head to right and a scorpion, may be the next denomination down in this Milesian series. Alternatively, they may be Lydian or Carian in origin. The table below summarizes this first electrum series from Miletus. Illustrations of most of the denominations may be found in Konuk (2002, 2003), and in the Miletus section of the Wildwinds database. A single hoard containing representatives of all of the denominations in the series, including at least eleven twelfths and fourteen twenty-fourths, was discovered about 1990 and has been recorded and partly illustrated as hoard #2 in Coin Hoards VIII (Wartenberg et al., 1994: 1, pl. 1). The two specimens in this collection (RJO 73 and RJO 82) may have been part of that hoard. Table 1. The Archaic Milesian electrum series, about 600–550 BC. Lion-scalp electrum from Miletus? Another series of early electrum lion coins struck on the Lydo-Milesian standard is sometimes attributed to Miletus: coins that feature a facing lion’s head or scalp, or, in the case of the full stater, two lion scalps back-to-back. Four coins of this type were sold in Gemini Auction VIII (14 April 2011), including a full stater (lot #74), a third stater (lot #75), a twelfth stater (lot #76), and a twenty-fourth stater (lot #77). The assignment of these coins to Miletus is uncertain, although they do bear some similarity to the silver dotted lion-mask issues of the city. The twelfth and twenty-fourth staters in the Milesian electrum series both feature a lion’s head, either in profile (twelfths) or facing (twenty-fourths). Staters, thirds, and sixths feature a complete image of a recumbent lion regardant, as described above. Twelfth-stater specimens most often show a lion’s head to right on the obverse, but specimens with a lion’s head to left are also known. The quincuncial reverse links these coins stylistically to the series of tiny silver eye-swirl/quincunx fractions that are likely also from Miletus. RJO 82. 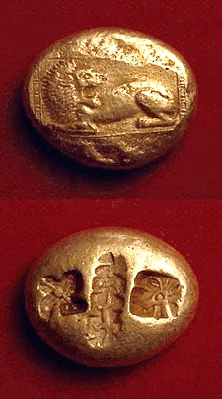 Electrum 1/12 stater (1.12 g), about 600–550 BC. Obverse: lion’s head right. Reverse: incuse quincunx. The two twenty-fourth staters described in the Kayhan collection weigh 0.53 and 0.52 g (Konuk, 2002: #453–454), and intriguingly, one of them (#453) appears to have some sort of marking on its forehead that is reminiscent of the “nose wart” seen on the early Lydian lion-profile coins. RJO 73. 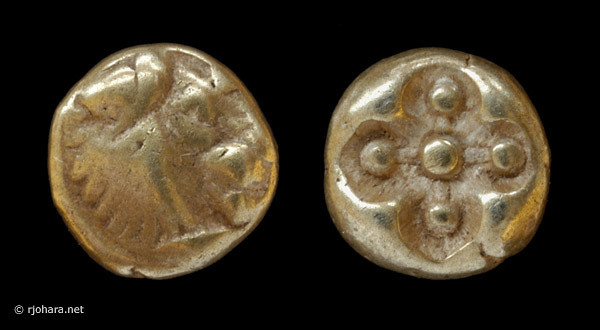 Electrum 1/24 stater (0.52 g), about 600–550 BC. Obverse: lion’s head facing. Reverse: square incuse punch.